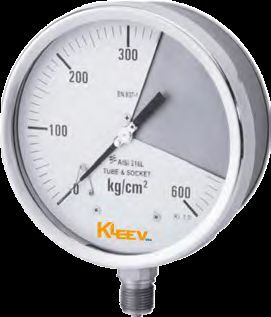 Exported and supplied by us from Singapore, Stainless Steel Solid Front Gauge belongs to the KPG-08 series. Its nominal size is 63/100/150mm and its wetted parts are AISI 316L SS / Monel. It has the accuracy of ±0.5% F.S ±1.6% F.S for NS is 63mm. Its range is up to 2000 bar. It has dry / liquid filled execution. It has the protection of IP67.